Long time lurker, Recent 32 buyer. SN #1820. Can I ask a total noob question? - when I want to power down, can I simply remove the power from the unit? There is no off sequence with the unit? No OFF sequence that I know of but it pays to keep two things in mind: don't turn Mom off if she's writing something and I generally turn the volume knob down before power off. mmarsh100 wrote: No OFF sequence that I know of but it pays to keep two things in mind: don't turn Mom off if she's writing something and I generally turn the volume knob down before power off. Thanks a bunch Mmarsh100! Will be sure to put that into practise. a Thereministic Question: How does the mother work with the Etherwave Plus CV's? I just bought three mother 32's and am brand new to synthesis. Just got the sub 37 a couple years ago. 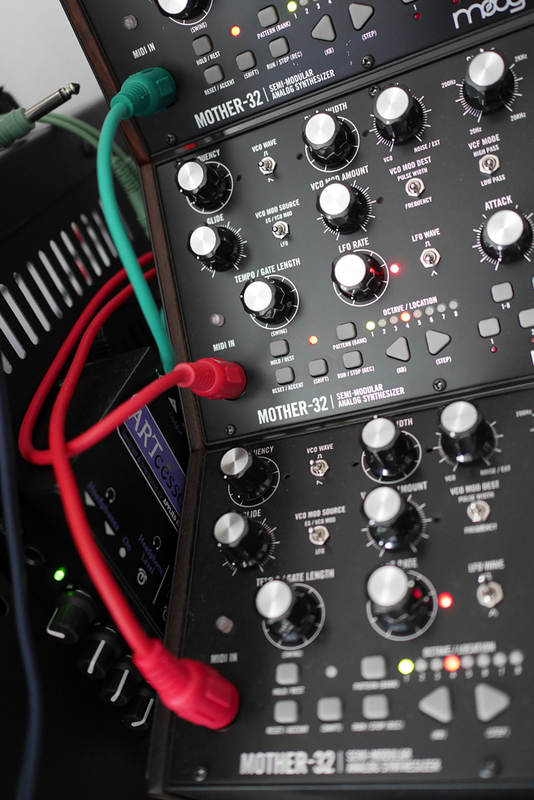 I want two of the mothers (sometimes three) to act as one synth for drones in my band. Do I have to have an audio out cable coming out of both of them (or all three) into my speaker or is there another way? I don't use anything else its just straight from the mothers to the speaker. franklinstower wrote: I just bought three mother 32's and am brand new to synthesis. Just got the sub 37 a couple years ago. You should get a mixer. Its possible without a mixer by running vca of M32#1 out into external in of M32#2, then use mix knob to blend the two, but gets convoluted with three. Also can run vco waveform to external in, but that's more for layering oscillators of two and specifically mixing waveforms. Basically running the vco into external in uses the eg's and filter of the one it is going into with straight oscillator, while running the vca into the external in of another gives the full output after eg's and filter of the unit with vca out. If you plan on running seperate sequences for drone sounds while main sequencer is running, then you need a mixer. Even if the other two are slaved to first sequencer pitch with vco mode set to "on" (for drone sounds), you will want a mixer to get more precise mix and full sounds and a must if wanting to use noise in the mix at all with mix knob controlling amount of noise to osc mix. For three M32's its just way less complicated patching. A small mixer will solve a lot of issues. The synths don't have a real bypass mixer in them, so anything going into external in is going to get processed through eg's and filter settings of the synth you are routing stuff into. Ok Ill get a mixer. I have to go with the cheapest used thing I can find for now-- is there anything I should not get or that you recommend? franklinstower wrote: Ok Ill get a mixer. I have to go with the cheapest used thing I can find for now-- is there anything I should not get or that you recommend? A small Behringer mixer is inexpensive, but basically anything that can mix the three channels and give either a stereo or mono out to your powered speaker setup. I use a Behringer fx series. Has some built-in fx that are passable in a mix. You don't need to worry about fancy, just one that can accept three unbalanced cables in and give you a 1/4" out to your speaker. You can use pan settings hard to one side on all three mothers, then on output too, to get your mono mix to speaker. Very helpful -- thanks all of you. I had no idea I needed a mixer and had been combing through my owners manuel trying to find that obviouse thing I was missing that would make it all work. Do you have the MIDI In (RED CABLE) from the bottom mother going directly into a MIDI in (RED CABLE) of the middle mother? Where is the MIDI in (GREEN CABLE) going. How do you physically connect all three mothers to the ART powermix? I have a quadra thru. A kenton 5 thru also. Both great thru boxes. Just had to get second 12 channel mixer this year due to hardware expansion and quite a few synths with stereo outs. MV-8800 which sequences all my hardware synths has two midi outs, so up to 32 midi channels really. No room for that many synths though. Blofeld, Virus, old jv1010 are multitimbral though. I don't use all the channels. Too much in the mix. Can get about 6 going at once and the sampler loaded with a drumkit and a few choice samples and it is really full sounding.